This e-learning package is intended for Trust staff directly involved in the process of recovering treatment costs from overseas visitors and migrants (Overseas Visitor Managers (OVMs) and frontline administrative staff) and staff who want to learn more about the charging rules and their role in supporting their Trust to implement them. There are sessions that are targeted for specific audiences, including OVMs, frontline staff and clinicians. This session introduces cost recovery from overseas visitors and migrants, and highlights to whom Charging Regulations apply. This session will discuss specific ways to charge overseas patients or to recover the costs of their care. This session will explain the role and responsibility of all those responsible for managing the recovery of healthcare costs from overseas visitors. This session will explain the role and responsibility of clinical staff in recovering costs from overseas visitors for their NHS healthcare. This session will describe the role and responsibility for administrative staff in the visitor and migrant NHS cost recovery. This session is designed for all staff who work with patients who could potentially be chargeable overseas visitors. This session includes steps to take to ensure that all patients are treated fairly and non-discriminatorily, so that health equality and vulnerable groups are not negatively impacted in the implementation of the Charging Regulations. This session sets out the financial arrangements for implementing the charging rules in NHS Trusts. This session explains the process for charging overseas visitors for their healthcare and the steps you need to put in place. This session describes the enhancements to the ‘chargeable status’ part of the patient record on the Spine and the process for making changes to the information on the record. The Department of Health is working to improve the systems for charging overseas visitors and migrants for their NHS healthcare in England. The principle that the NHS is free at the point of delivery for residents will not be undermined by this work. We aim to support and reinforce the principle of fairness by ensuring that everyone who can should contribute to the cost of the NHS. The Cost Recovery Programme was introduced in summer 2013. The programme’s measures are designed to improve cost recovery from chargeable patients. We introduced the NHS (Charges to Overseas Visitors) Regulations 2015 (the Charging Regulations) on 6th April 2015. Our e-learning is designed to support NHS organisations in their implementation of the Charging Regulations. If you already have an account with e-LfH, then you can enrol on to the Overseas Visitors Cost Recovery programme by logging in to the e-LfH Hub, selecting My Account > Enrolment and selecting the programme. You can then access the programme immediately in the My e-Learning section. 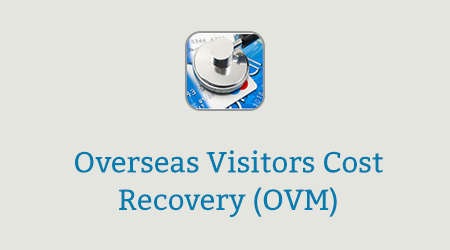 The Overseas Visitors Cost Recovery programme is also available to NHS healthcare staff via the Electronic Staff Record (ESR). Accessing this e-Learning via ESR means that your completions will transfer with you throughout your NHS career. Click below to watch our video on the Cost Recovery Programme, and find out more on the role of clinical staff in ensuring that everyone who can does contribute to the cost of the NHS.